I know, It’s been ages since I last posted something and I still want to blog about my trip to Kassel and the Documenta last month, a trip to Kaiserswerth with my parents some weeks ago and the review about the Lonely planet magazine that I got a subscription for isn’t finished yet either. But now I’m on a bike trip from Den Hague to Amsterdam so I decided to be up to date first and blog about things a little past later. 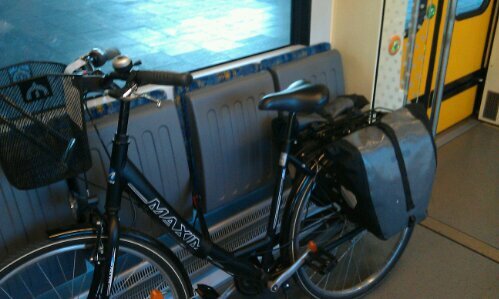 Yesterday I made my way from Dusseldorf to The Hague. By car two hours, by train if you take your bike with you, it took nearly four hours…. In the Hague I met my friend Ulrike who had already arrived with the night train from Freiburg and we explored the city a bit. The Hague is nice but not overly exciting so we soon made our way to The Hague’s beach suburb Scheveningen where we had booked a hotel for the night. 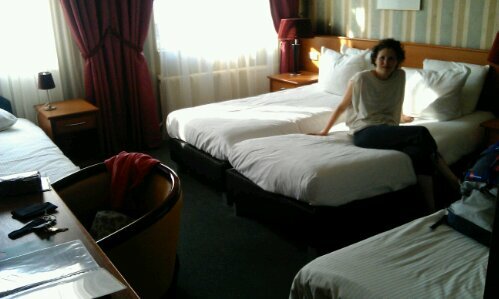 Arriving there we realized that we not only had a three bed room as planned (actually Tine, our friend from Brussels was supposed to join us but had broken her toe last week on her birthday – get well greetings to you at this point! ), but there were even four bed cramped into the room. But well, more choice for us. The weather was not too bad yet rather cold when we went for a stroll along Scheveningen’s really ugly promenade (lonely planet describes it as a place where architects that didn’t even get hospital building jobs anymore went amok and created nightmare buildings). Not willing to pay too much for dinner, we got some Chinese take away which actually wasn’t that great either, but well, it was eatable. We went to bed early to prepare for a long day today and skipped the expensive breakfast in the hotel for two slices of Dutch breakfast cake we had bought the other day and some fruit, cookies and a cold coffee drink that we bought in the tiny supermarket around the corner. 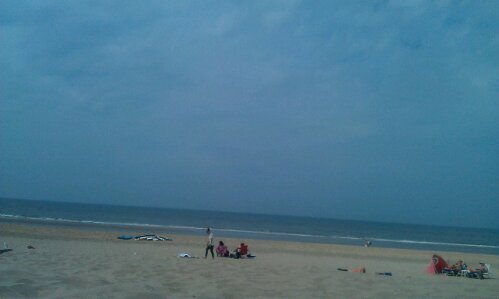 Of we went and the first 14km to Katwijk were over within the blick of a eye. Well, for other bikers it must have been even quicker as we were overtaken frequently by sporty bikers. But hey, we enjoyed the lovely North Sea dune landscape. 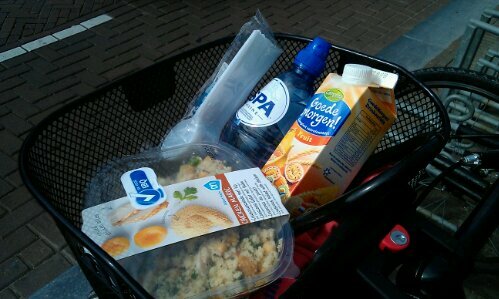 And after a quick drinking break we went 6km more to Nordwijk, only to stop for more water and some cookies. It was not yet 11a.m. then and we decide to ride a bit further. 15km later and with that in the middle of the day’s tour we arrived in Zandvoort. Realising that Zandvoort was nearly as ugly as Scheveningen and with that far more ugly than cute little Katwijk and also more ugly than so-so Nordwijk, we skipped going to the promenade and got some pre-packed salad for lunch from the supermarket and went to the beach, but a bit further north on our route to escape touristy Zandvoort. And here we are at the moment, enjoying beautiful North Sea summer weather (totally not according to the weather forecast that said today would be cold and rainy but who would complain about that), before we finish todays tour in Haarlem in a few hours and then go on to Amsterdam. 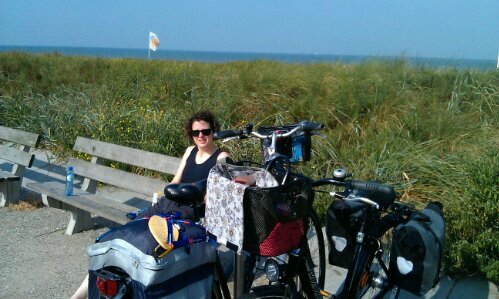 This entry was posted in Netherlands and tagged Beach, Bike, Short Trip, Summer by kathatravelling. Bookmark the permalink.